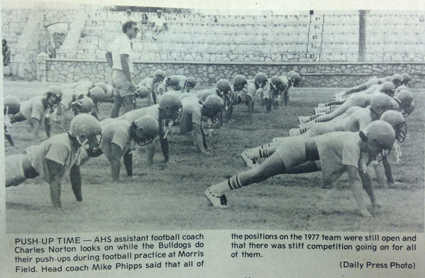 Looking back 40, 30 and 20 years ago, the following are excerpts from the Artesia Daily Press from Aug. 6-12. In 1955, J.A. Fairey Real Estate sold the building at 119 W. Main St. to Ed and Roberta Havins. The building currently houses the Artesia Furniture Company. Now, 22 years later, Fairey has sold a similar building, the J.C. Penney building at 401 W. Quay Ave., to the Artesia Furniture partnership of Ed and Roberta Havins and Eddie and Carol Havins. The new location at 401 Quay, which will operate as an annex to the Main Street location, will have a large selection of used furniture and appliances, as well as new. Over the past 33 years, both Artesia Furniture and Fairey Real Estate have progressed and grown while serving the community of Artesia. As reported in the Pinon News: The Prude and Stephens families had their annual family reunion at Sacramento. The really old members of the family were: Edna Prude Stephens and Alabess Prude Stephens. They were sisters and married brothers, John O. and Chester Stephens. Both families were residents of the Weed and Sacramento areas many years ago. Mr. and Mrs. Chester Stephens lived at the Ira McKinley place east of Sacramento in the early 1900’s. Of this area to attend were Mr. and Mrs. Max Cartright and Mr. and Mrs. Preston Means. Mrs. Cartright was a Prude before marriage and Preston Means is her son. Tina Lewis, in the girls’ 12-14-year division, and Richie Price, in the boys’ 16-17-year division, qualified for the state junior golf championship, to be held in Socorro. Both golfers said they had practiced hard and well at the Artesia Country Club in the days leading up to the tournament. The next time you place an order for frumpets, get ready for a side order of problems. First of all, you won’t find frumpets at any restaurant or grocery store. Pet stores and novelty shops won’t know what you’re talking about if you ask to see the latest in frumpets. And, frumpet is not a misspelling of trumpet, but the trail is getting warmer. When Artesia Public Schools band director Bill Surface requested two frumpets through Superintendent Warren Nell’s office, Nell thought certainly the word had been misspelled. A band director would need trumpets, not frumpets. No, Surface said, we have trumpets, but we’d like to get two frumpets. Thus the order was placed. The music company, like almost everyone else, filled an order for trumpets. Wrong again. What the band director wanted, as he kept pointing out, was frumpets. Enough of this. Just what is a frumpet? A frumpet, Surface said, is a combination French horn and trumpet. It somewhat resembles a trumpet but has many of the characteristics of the more expensive and fragile French horn. French horns are rarely used in marching bands because of their delicate nature, Surface said, so someone designed a French horn with more versatility. Hence, the frumpet. Case closed. Lyn Thigpen of the Cottonwood 4-H Club is the cake competition winner of the 1977 Eddy County Fair. Lyn won the honor with a tropical carrot cake decked with nuts. The cake will be auctioned off Saturday. Some cakes have been known to sell for as much as $800. Boyce Charles Gleghorn, assistant to the vice president of refining at Navajo Refining Co., retired effective July 31 after 43 years and four months of service. Recent graduates of Artesia High School Wade Nelson and Scott Ford have received $400 scholarships from the Artesia Masonic Lodge. Nelson, the son of Barbara L. Nelson, plans to major in electrical engineering, while Ford, the son of Tommy Ford, plans to major in criminal justice. Both plan to attend New Mexico State University this fall. “Benji The Hunted” and “The Witches of Eastwick” were the featured films at Cinema Twin this week. People in Houma, La., are wearing “I Love Artesia” buttons, and the Artesia Babe Ruth All-Stars have found that city to their liking, as well. The New Mexico state champions defeated Arkansas 8-7 in a thriller Saturday night, and they take on Louisiana at 6 p.m. Aug. 10. Rain washed out all play Sunday and moved the entire tournament schedule back one day. Coach Mike Allen called Saturday’s come-from-behind win over Arkansas one of the most exciting games he has ever coached. Artesia trailed 7-1 in the fifth inning. “Everybody in this town is still buzzing about it,” he said. The team cannot rest on its laurels, however, because the Louisiana champions from New Orleans are another powerhouse. Allen was unconcerned about the one-day rain delay. “I think it’ll be good for them — I really do,” he said. He and some of the players visited a fishing village on the Gulf Coast Sunday, and other players went on similar outings with their host families. Allen said the Artesia Chamber of Commerce gift packets have been a big hit in Houma, and the host parents are wearing their “I Love Artesia” buttons. “They’ll know where Artesia, N.M., is before we leave,” Allen promised. Lisa Klein of Artesia had the Grand Champion steer at the Eddy County Fair, according to judges. The steer weighed 1,188 pounds and sold for a total price of $4,500. The buyers were N.M. Salt & Minerals, Navajo Refining Co., La Tienda Thriftway, Western Bank of Artesia, Norwest Bank, and Thriftway of Artesia and Carlsbad. Jake Klein of Artesia was the winner of the Grand Champion lamb at the Eddy County Fair for 1997. The lamb weighed 115 pounds and sold for a total price of $1,000. The buyers were Bennie’s Western Wear and Tropical Sno. As reported in the Pinon News: Avis Henry, who lives in Roswell, and his grandson, John Henry, of James Canyon, visited Mrs. Holcomb and the Stringfields. Avis has been a friend of theirs for some time. They had lunch together and reminisced the old times. Avis had not been to the ranch in about three years. John Henry plans to attend New Mexico State University in Las Cruces to study Hotel Management.